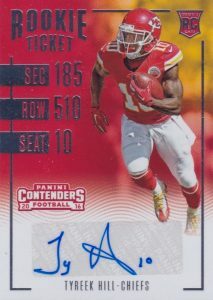 A yearly powerhouse with rookie collectors, 2016 Panini Contenders Football, and the much celebrated Rookie Ticket autographs, returns for another NFL season. 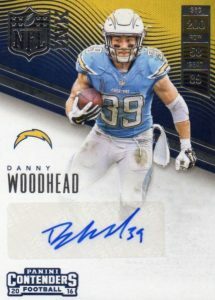 Collectors can find at least five autographs in each hobby box with one or two being on-card signatures. 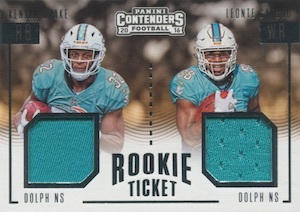 As many collectors are aware, the base set in 2016 Panini Contenders Football includes various "Ticket" cards. The full base set totals 390 cards between the Season Tickets, which act as the main base, plus the autographs: Rookie Tickets, Rookie Ticket Variations and Coaches Tickets. 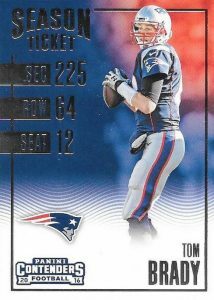 There are also Playoff Ticket, Championship Ticket, Cracked Ice Ticket (#/24) and Super Bowl Ticket parallels as well as Printing Plates (1/1) for each part of the massive ticket set. 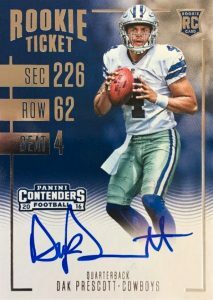 While the base set is filled with autographs, 2016 Panini Contenders Football does not stop there. 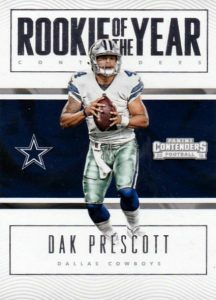 Draft Class Autographs and Rookie of the Year Contenders Autographs highlights top rookies with Gold and Platinum parallels. Also focusing on the first-year players, Round Numbers Dual Autographs (#/99 or less) pairs players drafted in the same round with signatures for each. 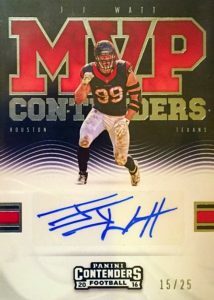 Limited to 49 copies or less, Legendary Contenders Autographs looks to the all-time greats while MVP Contenders Autographs documents the favorites for the annual award. 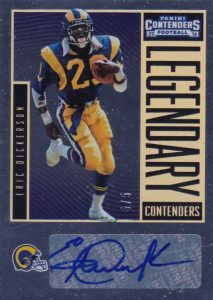 With a similar design to the base set, NFL Ink presents even more signed options, including Gold and Platinum parallels. 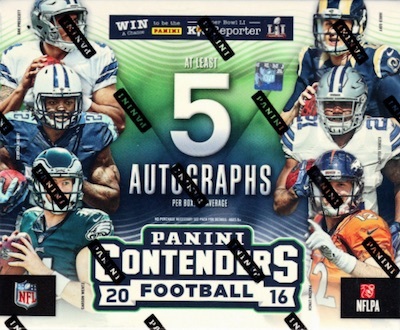 Clearly, autographs are the main draw for 2016 Panini Contenders Football. However, set collectors have quite a few standard inserts to chase. 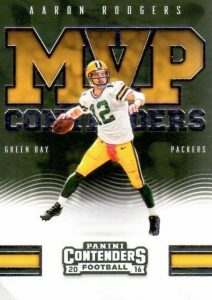 Mirroring many of the signed sets are Legendary Contenders (1:12 packs), MVP Contenders (1:12 packs), Rookie of the Year Contenders (1:8 packs), Round Numbers (1:12 packs), and Touchdown Tandem (1:24 packs) inserts. Putting a Willy Wonka spin on things, hobby-exclusive Silver Tickets and Golden Tickets return as rare inserts. 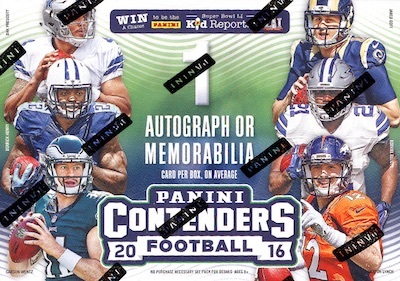 Releasing a few weeks before hobby boxes, 2016 Panini Contenders Football retail formats are also available. 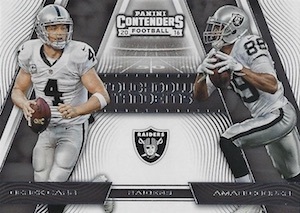 Although the main design is different, many of the same players are covered in the collegiate 2016 Panini Contenders Football Draft Picks set. Short Prints noted below: SP = 250 copies or less, SSP = 99 or less. PARALLEL CARDS: Playoff Ticket #/249, Championship Ticket #/99, Cracked Ice Ticket #/24, Super Bowl Ticket 1/1, Printing Plates 1/1. PARALLEL CARDS: Playoff Ticket #/199 or less, Championship Ticket #/99 or less, Cracked Ice Ticket #/24, Super Bowl Ticket 1/1, Printing Plates 1/1. PARALLEL CARDS: Playoff Ticket #/99, Championship Ticket #/49, Cracked Ice Ticket #/24, Printing Plates 1/1. 80 cards. The base version is vertical and the variation is horizontal. PARALLEL CARDS: Playoff Ticket #/199 or less, Championship Ticket #/99 or less, Cracked Ice #/24 (No card #309), Super Bowl Ticket 1/1 (No card #349), Printing Plates 1/1 (No card #309,349). 20 cards. These have a different image from the base but are easy to distinguish based on the monochrome effect. *SEPIA PARALLEL CARDS: Playoff Ticket Sepia #/199 or less, Championship Ticket Sepia #/99 or less, Cracked Ice Sepia #/24, Super Bowl Ticket Sepia 1/1. PARALLEL CARDS: Gold #/16, Platinum 1/1. PARALLEL CARDS: Gold #/199, Holo #/99, Black #/10. 20 cards. Serial numbered #/2. 4 cards. Card #5 only has Platinum parallel. 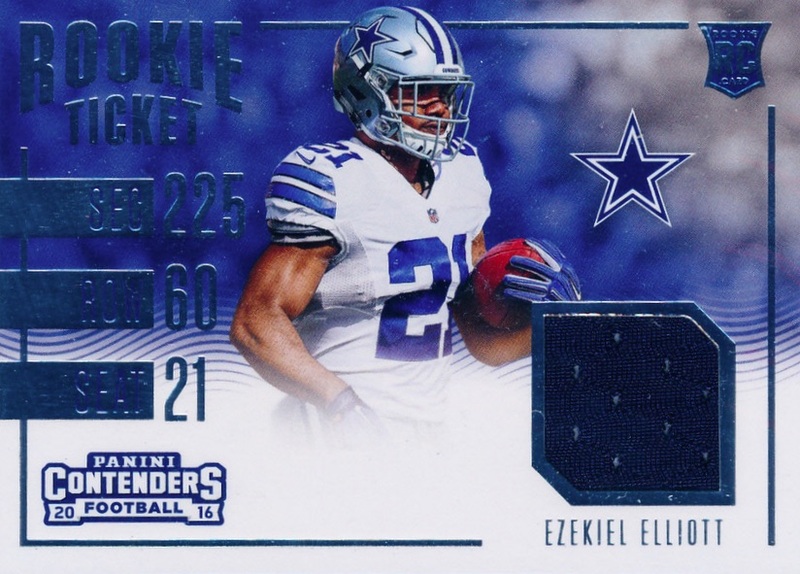 Hey Trey are the Rookie Ticket swatches exclusive to fat packs (22 cards)? Not sure. Retail came out weeks before hobby so we are still waiting on a final checklist. 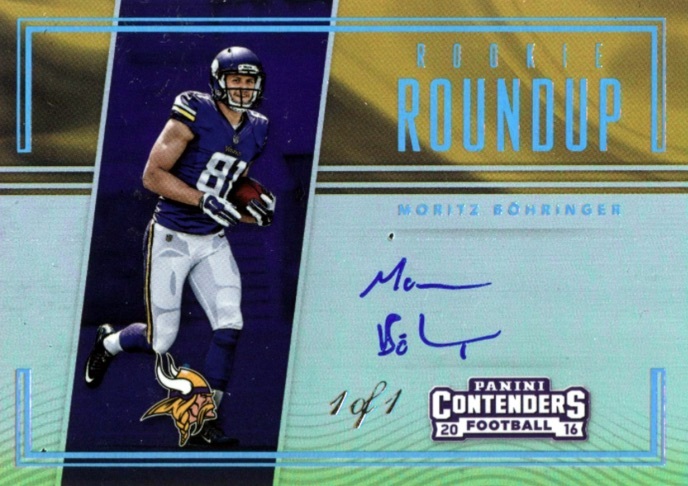 Greatly disappointing purchase several retail boxes containing lowly drafted rookies and inserts. The worthless cards absolutely priceless. 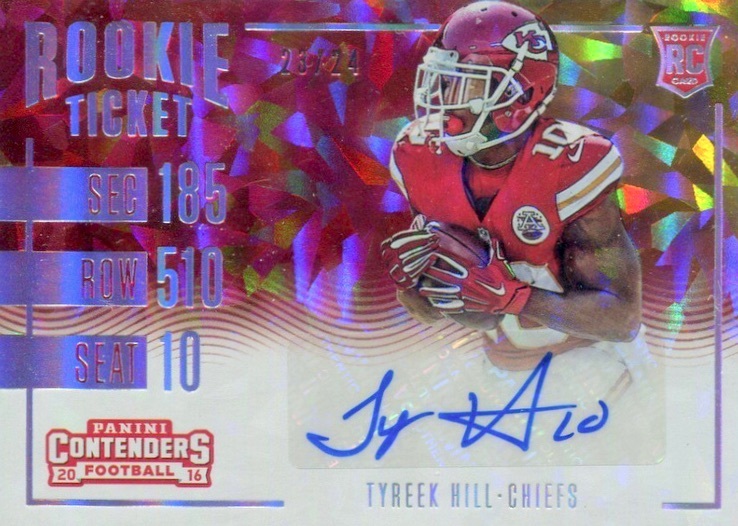 The retail product as usual produces the garbage low end autos with the occasional miracle pull. I recently bought a box of the hobby product and was more than amazed at what I pulled. I pulled a joey bosa championship ticket variation redemption /25, Jordan Howard draft class auto, Keanu Neal rookie ticket auto, Maliek Collins rookie ticket auto, and a couple other no names. As a cowboys fan I was shooting for the Dak and Zeke autos but the Maliek Collins was good and to really add to the sweet break the Bosa and Howard autos were great! I always get excited when this product comes out. Try it out! bought some hobby packs and pulled a digital rookie ticket Prescott gold ink auto. thought I won the lottery. however, these cards appear to be worthless even with a code on them to redeem. 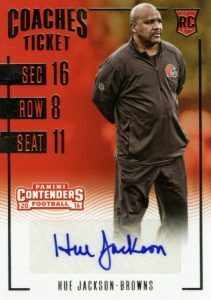 I sure hope panini decides to make these cards physically real. otherwise I have nothing but air. Cards have the classic look which I like. Bought $50 retail box. 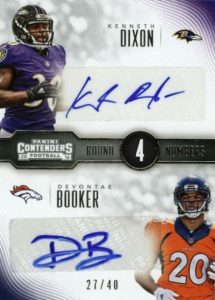 Guaranteed 1 auto and 2 jersey hits per box. Got 3 no names for all my hits. One pack was only 7 cards and had duplicates of some base cards. No #’d cards in the entire box either. Id rather buy something else for $50 or maybe put it towards a Hobby box with 5 hits. You fools spending money on boxes thinking your gonna get a big hit, it’s like playing the lotto it’s a losers game, don’t cry about spending money and getting nothing, in 48 hours from releaseI had the one and only Zeke auto I’m buying in the set, paid what the cost of 2 boxes would have been, get smart cry babies. Panini really disappoints me. 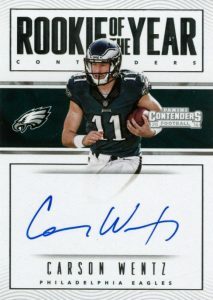 Now that Topps is gone, I saved my money specifically for Contenders boxes. Not only is every autograph or jersey card I received one of someone I have never heard of, but if you don’t get the insert of a rookie player you want, you don’t get any card of that player. 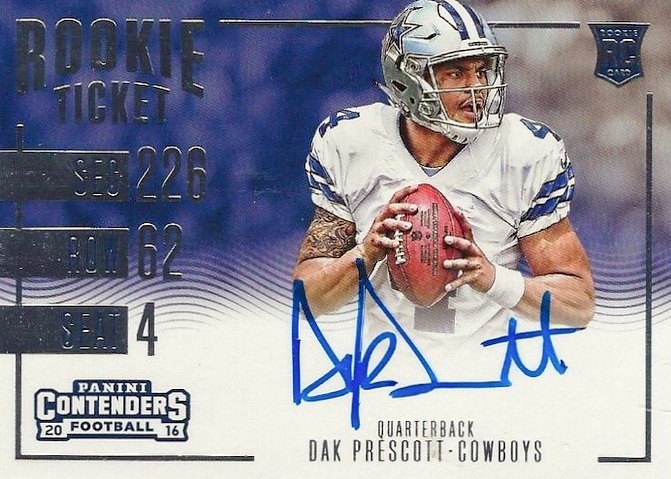 With Chrome, you had base cards, variation cards, and several refractor and autograph variations, but at least you would have a chance to get cards of players like Dak and Zeke. 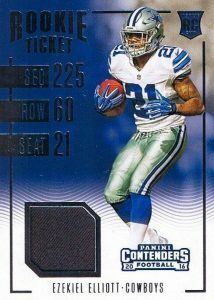 With Contenders, you just get a base set of 100 cards and a whole lot of nothing besides. Don’t waste your dollars on this one! It’s a case product. I did two cases and did great. 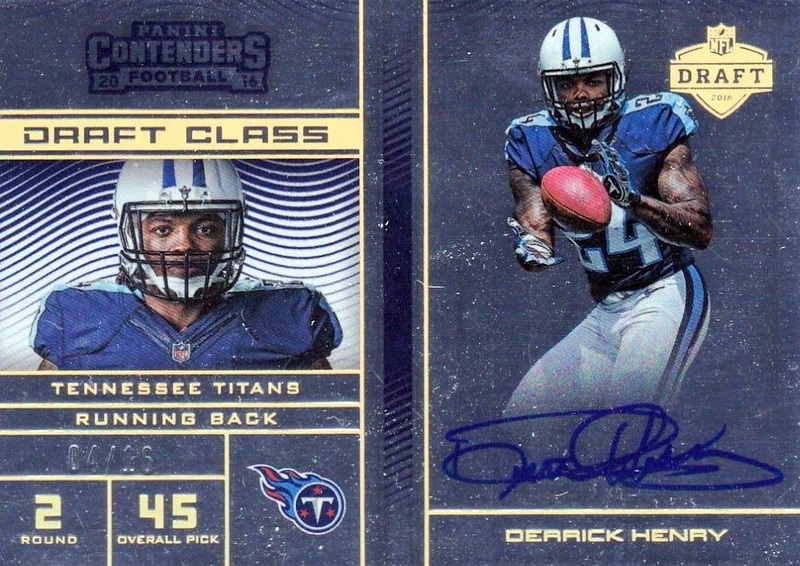 Wentz cracked ice Auto, Elliot rookie ticket /25 auto, derrick Henry sepia auto /25. Also a plate auto, veteran autos. A lot of good stuff here. The Doctson Sepia is a SSP. 2016 Contenders was my most successful year yet to date..
Why? The hobby boxes (retail boxes are garbage) that I picked up had some nice hits in it. 2 cracked ice cards in 1/2 a case. 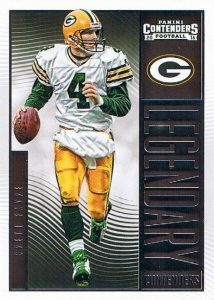 While we are on the subject of the base cards, I will say that the design of the cards are going away from the”ticket” look that we all love.. Panini if yo are reading this, please give this a re-look. 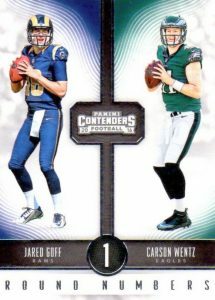 2016 Contenders Factory Sealed Football Hobby Box Carson Wentz AUTO RC ? ?